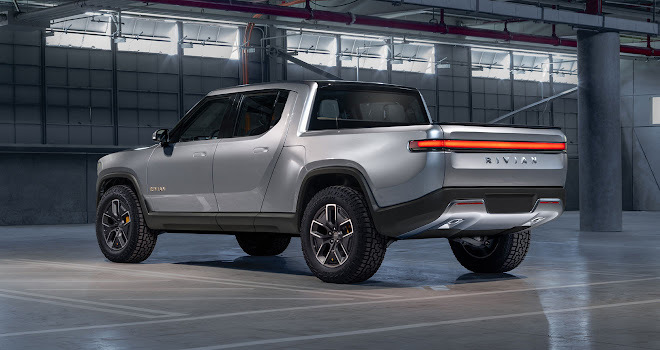 US startup Rivian Automotive made quite a splash when its R1T electric pickup truck and R1S electric off-roader debuted at the Los Angeles motor show in November. 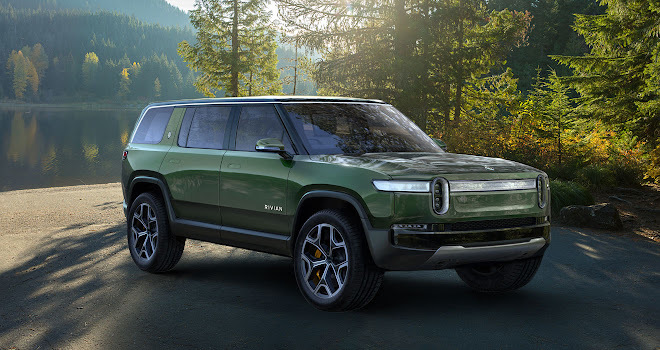 Much like another EV startup – Bollinger Motors with its B1 electric SUV – Rivian has created a vehicle with strong appeal among a swathe of people unlikely to ever be lured into a Nissan Leaf. 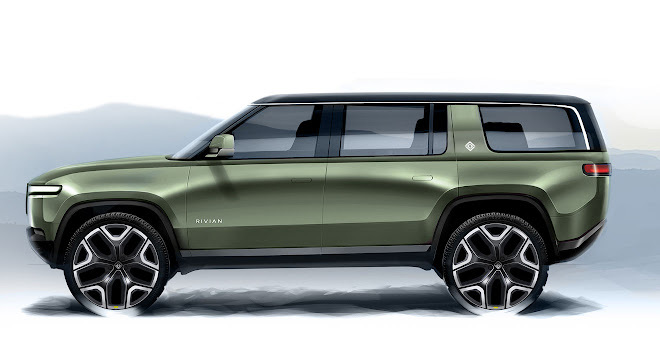 We spoke to Jeff Hammoud, Rivian’s vice president of design, about the two new electric vehicles. GreenMotor: The unveiling of the R1T and R1S drew a lot of admiration at the LA show. Were you surprised by the warmth of their reception? Hammoud: I was actually really shocked. I thought the cars were good, so I was expecting it to go positive, but honestly not as well as it went. I’ve had many, many unsolicited comments from designers at other companies. Hearing from your peers is always the highest compliment. 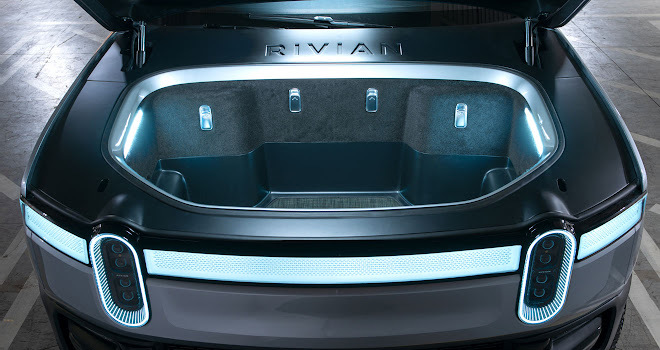 You joined Rivian as head of design in May 2017. What stage had development work reached at that point? The engineering was much further along than the design, which was good. I still had time to influence proportions, wheelbase – things like that. I also had to hire a design team, and then we moved to a new facility in January 2018, so we had to get that whole studio up and running. The majority of the design work was done in the last year. Somewhat less, because a big part of that timeframe was spent actually building the vehicles. The design was frozen back in the summer. Were the vehicles shown in LA concept cars, prototypes or pre-production models? They’re prototypes that are very, very close to production. They’re full runners, with a full drivetrain – everything in there is product-accurate in terms of content. There will still be little things that get adjusted, for aerodynamics or stamping radii for production feasibility. But the show cars are fully running prototypes of what we’re planning to build. What were your design goals for the R1T and R1S? 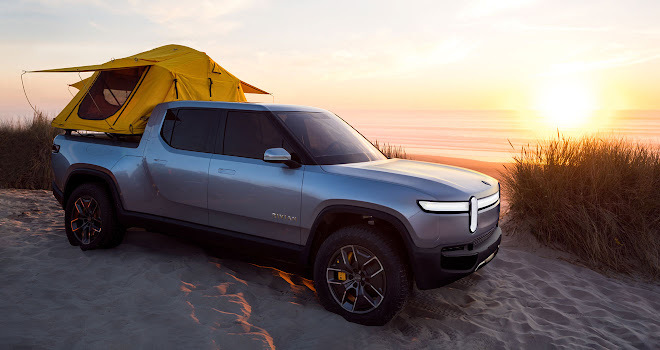 We want Rivian to be an adventure brand, but still premium. I think the biggest challenge for us was coming up with a face – a brand identity. We wanted something immediately recognisable, but also something we could build on. We didn’t want something that worked for just one or two vehicles; we had to be able to scale it. On the interior side, we spent a lot of time on how to make it feel premium but still usable. We looked at the outdoor industry, at hiking gear, backpacks and footwear, and we used materials and aesthetics from that space. 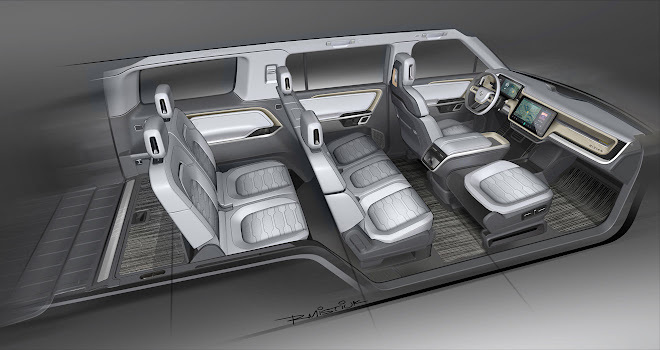 For example, we showed the R1T truck with a green interior. Nobody in the automotive space uses green on the inside, but the outdoor industry uses it all the time. 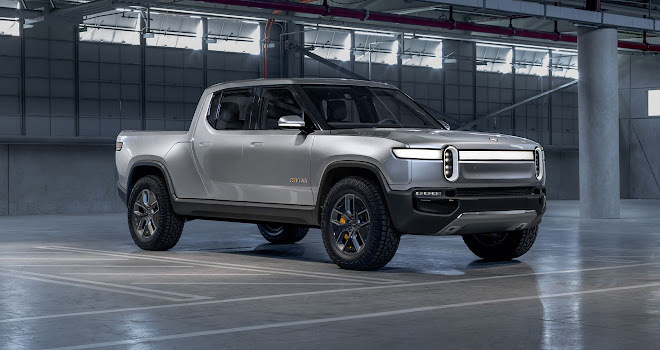 Are Rivian’s vehicles aimed solely at the US market? The truck is more US-based, but other markets are where the R1S comes in. That’s why it’s the size it is. If we went any bigger, it probably would size itself out of the market in Europe and Asia. Those are markets we’re looking to go into, so we did take their expectations into consideration. We are working on homologating both vehicles for overseas. 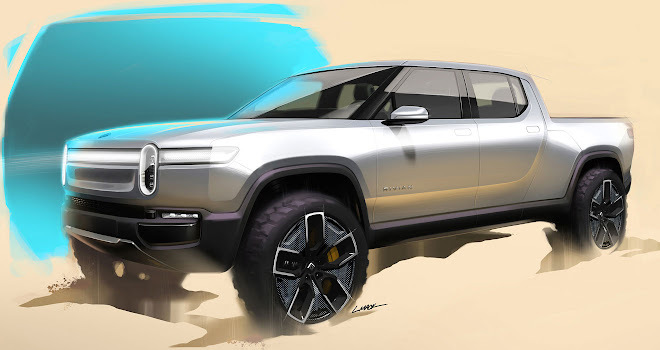 How much do the SUV and pickup have in common? The two are virtually the same from the B-pillar forward. The roof is different between the truck and SUV, as is the trim around the side glass. But the front door is common, the front fenders, the hood and the headlights are common. 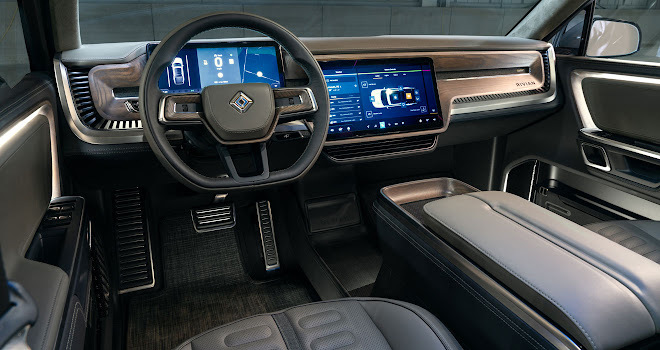 Inside the dashboard and front seats are the same. When I first came in, the windshield was in a very different position. Knowing that we were going to do two different vehicles, the SUV was the one that set up the proportions. If you put the windshield really far forward, for example, it didn’t really look good on the SUV. It made it look like a van or some sort of monovolume, and it just didn’t look right. So by pulling the A-pillar back, it created better proportions but it also helped us increase the front trunk volume as well, which is a big feature. We have over 330 litres of storage up there, which is a big advantage for a seven-seat SUV. Even if you have all three rows occupied, you still have some storage behind the third row seat as well as a big front trunk space. So because it’s an EV, you can have good storage without having to go up to a much larger vehicle. How did you come up with the storage tunnel through the pickup truck, the door of which doubles as a step for loading the bed? Having an EV skateboard platform really gives you that opportunity. There’s no transmission tunnel, so the package opportunities are endless, basically. I’ve gotten the question: you could have done any proportion you wanted, why didn’t you push the aesthetic a little bit further? My response is: well, if you put a bed on it and call it a truck, people have a certain notion of what it’s supposed to look like. If you veer too far from that, you can alienate people. There’s something inherently classic about the proportions we did and we felt that was the right way to go. The R1T and R1S both look very “clean”, with relatively few feature lines and creases. Was achieving that kind of look of important? Yes. 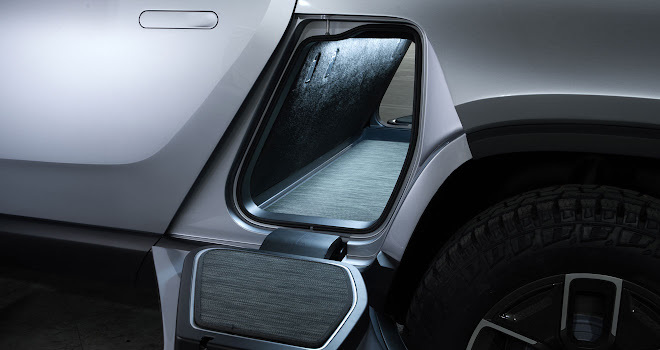 Even just something as simple as the charge port door on the front of the vehicle is integrated seamlessly. In fact numerous people have asked where it’s hidden – it’s on the passenger left corner. Whether it’s a charge port door or a fuel filler flap, it’s usually some arbitrary circle or square cut into the body. We really wanted to integrate it. 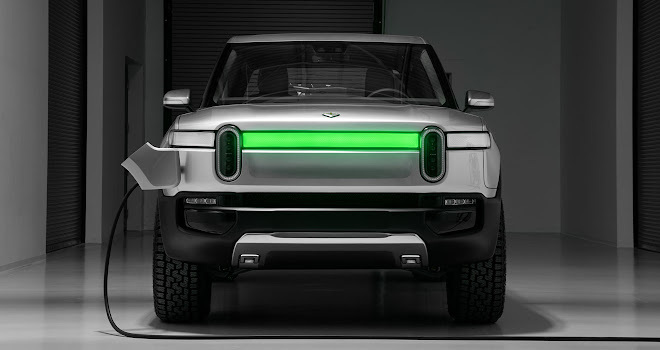 Also, the middle section of our full-width headlights, in addition to providing our daytime running light, also lights up green to show charging level, which I thought was a nice feature. The middle bar lights up in 10% increments to indicate the current charging level is, horizontally like the battery symbol in a cellphone.